A full photo kiosk on every’s client smartphone! Mobile Photo Kiosk is a service that allows you to create a full photo kiosk directly on your client’s smartphone or tablet. Show your products to the clients and give them the opportunity to order without leaving home, directly from the mobile device. License for the first shop/server that receives photos from your clients. 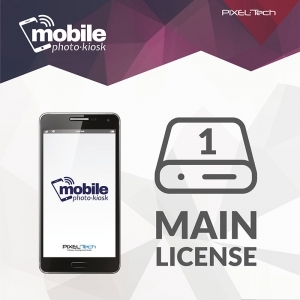 The basic license required to run the Mobile Photo Kiosk service. 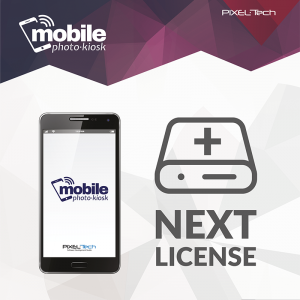 To activate your account, simply fill the form at www.mobilephotokiosk.app and enjoy the initial configuration and promo stuff we’ll deliver to you via email. License for the additional shop/server that receives photos from your clients. NOTICE: In order to run the second and any subsequent Mobile Photo Kiosk shop(s), you must already own a basic license or buy one. Router with an FTP server for the Mobile Photo Kiosk service! NOTICE: Requires an active basic Mobile Photo Kiosk license to run. 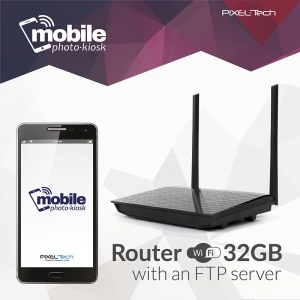 Router with an FTP server for the Mobile Photo Kiosk service is a simple and easy-to-use FTP server with a capacity of 32 GB, thanks to which you can receive orders and share the WiFi network to your clients without compromising your own internal network. There’s an additional option to configure working hours that allows you to cut off the network when the shop is closed.